The Wikipedia article states, "It is not known how Anscombe created his data sets." Really? Creating different data sets that have the same statistics sounds like a fun challenge! As a tribute to Anscombe, I decided to generate my own versions of the two data sets shown in the previous scatter plots. The first data set is linear with normal errors. The second is quadratic (without errors) and has the exact same linear fit and correlation coefficient as the first data. The Wikipedia article notes that there are "several methods to generate similar data sets with identical statistics and dissimilar graphics," but I did not look at the modern papers. I wanted to try it on my own. If you want to solve the problem on your own, stop reading now! Use a simulation to create linear data with random normal errors: Y1 = 3 + 0.5 X + ε, where ε ~ N(0,1). Compute the regression estimates (b0 and b1) and the sample correlation for the linear data. These are the target statistics. They define three equations that the second data set must match. The response variable for the second data set is of the form Y2 = β0 + β1 X + β2 X2. There are three equations and three unknowns parameters, so we can solve a system of nonlinear equations to find β. From geometric reasoning, there are three different solution for the β parameter: One with β2 > 0 (a parabola that opens up), one with β2 = 0 (a straight line), and one with β2 < 0 (a parabola that opens down). Since Anscombe used a downward-pointing parabola, I will make the same choice. You can use these values as the target values. 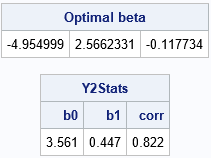 The next step is to find a parameter vector β such that Y2 = β0 + β1 X + β2 X2 has the same regression line and corr(Y2, X) has the same sample correlation. For uniqueness, set β2 < 0. You can formulate the problem as a system of equations and use the NLPHQN subroutine in SAS/IML to solve it. (SAS supports multiple ways to solve a system of equations.) The following SAS/IML statements define two functions. Given any value for the β parameter, the first function returns the regression estimates and sample correlation between Y2 and X. The second function is the objective function for an optimization. It subtracts the target values from the estimates. The NLPHQN subroutine implements a hybrid quasi-Newton optimization routine that uses least squares techniques to find the β parameter that generates quadratic data that tries to match the target statistics. /* This function returns the vector quantity (beta - target). Notice that the construction of the second data set depends only on the statistics for the first data. If you modify the first data set, and the second will automatically adapt. For example, you could choose the errors manually instead of randomly, and the statistics for the second data set should still match. What about the other data sets? For the data set that consist of points along a line except for one outlier, there are three free parameters. Most of the points fall along the line Y3 = a + b*X and one point is at the height Y3 = c. Therefore, you can run an optimization to solve for the values of (a, b, c) that match the target statistics. I'm not sure how to formulate the requirements for the fourth data set. It looks like all but one point have coordinates (X, Y4), where X is a fixed value and the vertical mean of the cluster is c. The outlier has coordinate (a, b). I'm not sure whether the variance of the cluster is important. In summary, you can solve a system of equations to construct data similar to Anscombe's quartet. By using this technique, you can create your own data sets that share descriptive statistics but look very different graphically. To be fair, the technique I've presented does not enable you to reproduce Anscombe's quartet in its entirety. My data share a linear fit and sample correlation, whereas Anscombe's data share seven statistics! Anscombe was a pioneer (along with Tukey) in using computation to assist in statistical computations. He was also enamored with the APL language. He introduced computers into the Yale statistics department in the mid-1960s. Since he published his quartet in 1973, it is possible that he used computers to assist his creation of the Anscombe quartet. However he did it, Anscombe's quartet is truly remarkable! You can download the SAS program that creates the results in this article. The post Create your own version of Anscombe's quartet: Dissimilar data that have similar statistics appeared first on The DO Loop.